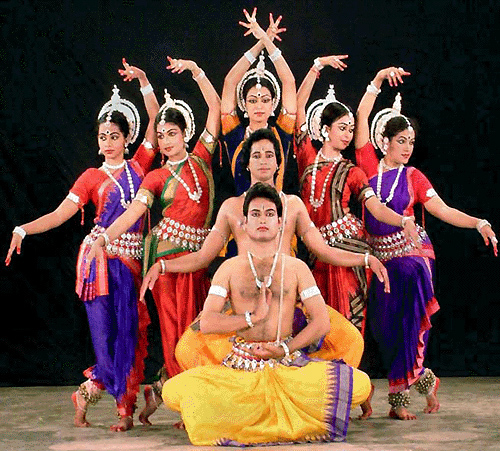 nata — dramatists; nartaka — dancers; gandharvah — celestial singers; suta — professional historians; magadha — professional genealogists; vandinah — professional learned speakers; gayanti — chant; ca — respectively; uttamasloka — the Supreme Lord; caritani — activities; adbhutani — all superhuman; ca — and. It appears that five thousand years ago the society also needed the services of the dramatists, artists, dancers, singers, historians, genealogists, public speakers, etc. Dancers, singers and dramatic artists mostly hailed from the sudra community, whereas the learned historians, genealogists and public speakers hailed from the brahmana community. All of them belonged to a particular caste, and they became so trained in their respective families. Such dramatists, dancers, singers, historians, genealogists and public speakers would dwell on the subject of the Lord’s superhuman activities in different ages and millenniums, and not on ordinary events. Nor were they in chronological order. All the Puranas are historical facts described only in relation with the Supreme Lord in different ages and times as well as on different planets also. Therefore, we do not find any chronological order. The modern historians, therefore, cannot catch up the link, and thus they unauthoritatively remark that the Puranas are all imaginary stories only. Even one hundred years ago in India, all dramatic performances were centered around the superhuman activities of the Supreme Lord. The common people would be verily entertained by the performances of dramas, and yatra parties played wonderfully on the superhuman activities of the Lord, and thus even the illiterate agriculturist would be a participant in the knowledge of Vedic literature, despite a considerable lack of academic qualifications. Therefore, expert players in drama, dancers, singers, speakers, etc., are required for the spiritual enlightenment of the common man. The genealogists would give account completely of the descendants of a particular family. Even at the present moment the guides in the pilgrimage sites of India submit a complete account of genealogical tables before a newcomer. This wonderful act sometimes attracts more customers to receive such important information.